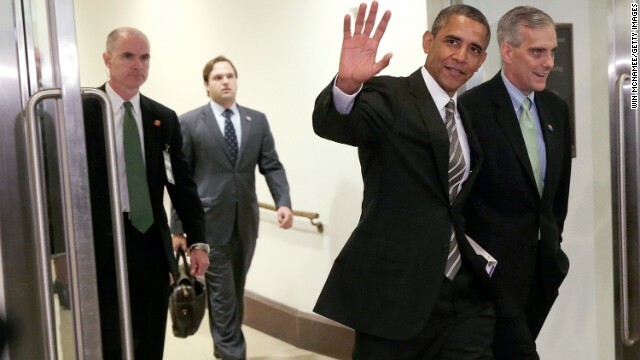 Washington (CNN) – During a question and answer session Wednesday with Democrats on Capitol Hill, President Barack Obama offered what Democratic sources said was a testy response to a question about a federal loan guarantee program, with one source in the room calling it "rude and dismissive." Other Democrats said they didn't think the president's response was dismissive, and pointed out Obama vowed to follow up with an answer. The lawmaker himself, freshman Democratic Rep. Sean Patrick Maloney of New York, said of the exchange, "I am the youngest of five brothers – I've been in a headlock before and it's all in good fun." But the reaction from some Democrats is reflective of long-simmering tension between the president and fellow Democrats on Capitol Hill, many of whom don't feel included or respected by Obama. The query came from Maloney, a New York Democrat, whose office says the freshman lawmaker asked the president about a company in his district that applied for a loan guarantee through the Department of Energy in 2009, but whose application has been stuck in the final approval stages. Maloney's office said Wednesday the loan would help create 300 jobs at the firm, Taylor Biomass. One Democratic source in the room said Maloney began his question by recognizing it was an issue that may be better discussed on the staff level, rather than with the president. Obama answered, saying "You're right. You should have talked to staff about this," the source said. Another Democratic source in the room – a veteran lawmaker – said Obama then said in a testy way to Maloney that at least now he can go back and tell his constituents he stood up to the president for them. This Democratic lawmaker said he felt for Maloney, who is new and clearly was sincere and respectful in his questioning. Both these Democratic sources have attended previous meetings between presidents and lawmakers on Capitol Hill, independently said Obama was unnecessarily unkind when responding to Maloney's question. Another Democrat in the room, however disputed the suggestion the exchange was testy. Maloney himself described the exchange this way: "I asked the President for a commitment to prioritize a local jobs project, and I got it. I appreciate the President's responsiveness." A Democratic source close to Maloney said the Democratic lawmaker "was not personally offended when he was talking with the president." "He just really wanted to raise awareness of this project," the source added. "He is not one who would express dissatisfaction with the answer he got." Jay Carney, the White House press secretary, said at Wednesday's briefing that it was not his "understanding" that the president was testy in his exchange with Maloney. "The president was very appreciative of the question," Carney said in response to a question from CNN chief White House Correspondent Jessica Yellin. "The question got into specifics about a program and I think the president not only said that his staff would follow up on it, he guaranteed that the president's staff would follow up on it. And he was very glad to see the interest in these kinds of programs that was expressed by the congressman." Multiple sources tell CNN that another heated moment came when Rep. Ed Perlmutter of Colorado asked about rumors that Larry Summers is being considered to head the Federal Reserve, and told the president it is a bad idea. Sources said the president got defensive and clearly upset, saying that he is sick of the Washington game and liberal press like the Huffington Post going off on Summers as not liberal enough. The president reminded the room of Democratic lawmakers that Summers was a key part of his economic team as they tried to turn the economy around in 2009. He also made clear that he has made no decision for the Fed chief, but noted that top choices, including Summers and Janet Yellen, are so similar in qualifications you "have to slice the salami" pretty thin to see the differences. CNN Chief White House Correspondent Jessica Yellin contributed to this report. The president is testy ?